It’s hard not to believe that some kind of robot takeover is underway, especially with the wide range of robots that we’re seeing: from giant industrial robots found on factory lines, to tiny micro-robots that can potentially perform surgery, microfabrication, diagnose disease or even fight cancer. But no matter the size, robots are constrained by how they are powered, propelled and controlled, particularly when it comes to micro-robots. Their diminutive size means that they can’t use propellers like larger aerial drones, and their movements are typically limited by either heavy batteries or being by tethered to a power source. For instance, small robots like Harvard University’s RoboBee are captivating in concept, but in reality, are hampered by the fact that they must be linked to a source of electricity through a wired connection. 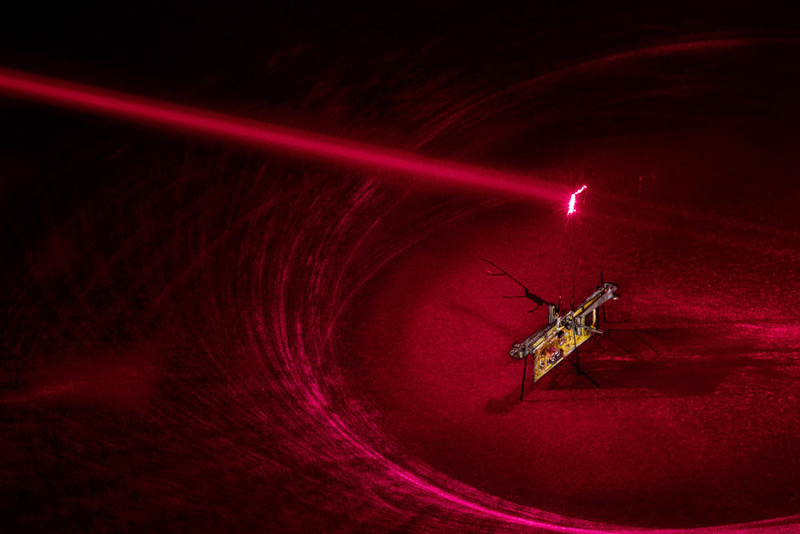 But researchers over at the University of Washington, however, have recently made a significant step in developing a method for wirelessly powering a micro-robot enough to lift off into flight — using lasers, of course. 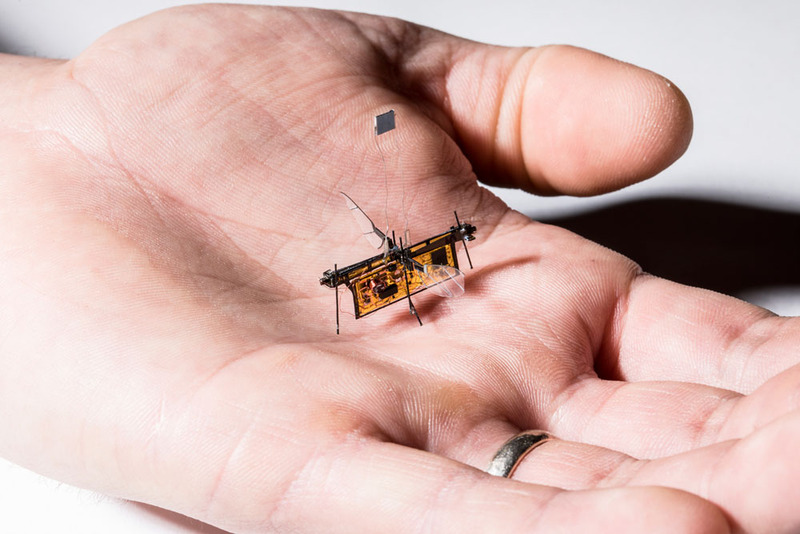 Dubbed RoboFly, it weighs about the same as a toothpick, and as we can see, it has absolutely no battery nor wires to impede it as it launches momentarily, rapidly flapping its wings. RoboFly’s brief lift0ff might not seem like much, but it’s actually the first time such a small robot has been able to take flight wirelessly. As the team explains in their paper, which was recently presented at the International Conference on Robotics and Automation, micro-robots cannot use propellers like their larger, heavier drone cousins, and so typically rely on flapping wings driven by piezoelectric actuators. Previous designs were also limited by the weight of the batteries required for wireless flight, as well as the (relatively) hefty onboard electronics required to step up the voltage and handle computations. 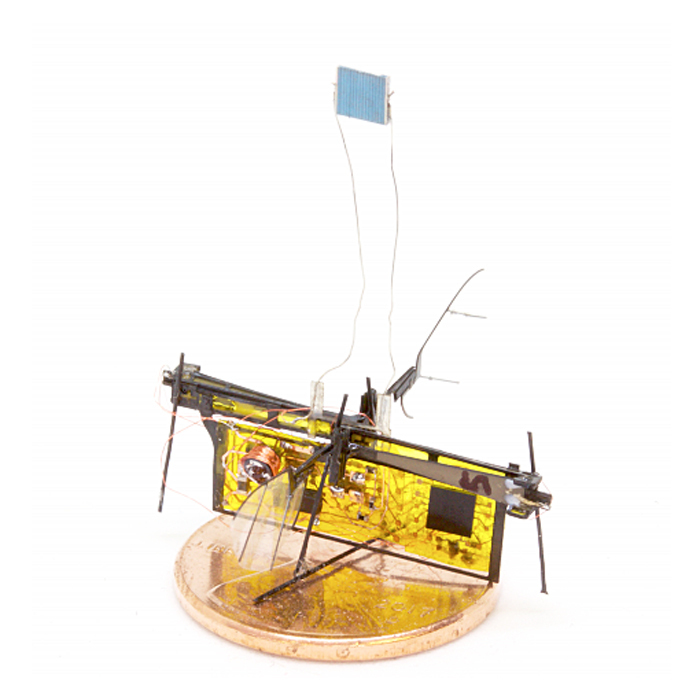 But to create a truly autonomous insectoid robot that can fly wirelessly, the team had to get around these challenges. To achieve this, the team developed their own circuit fabrication technique to create the tiny electronics needed for wireless, autonomous flight. Using this method, they were able to create a boost converter, piezo driver and micro-controller that weighed less than 100 milligrams, all of which were then integrated into the micro-robotic insect, for a total weight of 190 milligrams. The bot also has a tiny photovoltaic panel attached to it, which converts the constant power from the laser beam into electricity. But this alone generates a measly 7 volts, so this voltage is then augmented by the boost converter into 240 volts, which can then drive the rapid beating of the wings. The microcontroller acts as a ‘brain’ of sorts, modulating this current so that it produces movement similar to that of real insect wings. As you might have noticed, however, the RoboFly stops flying once it moves beyond the laser pointed at it. The team is now working on a way to steer the laser in tandem as the bot moves, so that it can maintain flight for longer distances. There’s also the possibility of using smaller batteries that can efficiently harvest energy from radio waves. If these improvements are achieved, there’s no telling where such tiny robots could go.